“The main point of this book is to inspire, help and encourage”. The author does this with many techniques of construction and styles. She is an enthusiast who includes many less well used techniques like smocking. She also plays with materials, mixing plain and patterned materials to brighten up styles. There are plenty of tips in each project. Ways of making your own work seem professional using feet, eyelets and other metal pieces are included. Each section is fully and brightly illustrated. Each given design stage is also shown in detail, with suggestions on how to make each unique. New comers or experienced stitchers would find plenty to inspire. The patterns in this charming book are small enough to be manageable and large enough for all ages to have a hand in making, from the older, more experienced knitter to the youngest beginner. Each figure is started with a simple card shape, followed by individual interpretation of a pattern. There is an interesting colour scheme for each figure but the author suggests that makers use their stash. 25g can make most of the figures with smaller amounts for features, animals and crib. There are patterns for gifts, stars and haloes. A pleasant touch is the inclusion of quotations of the Nativity story on relevant pages; the whole story is at the beginning. The patterns could make a seasonal project for a school class or even church group. Every stitcher has a stash of goodies they keep for that special project. This book will provide many ideas on how to use these, not just textile but the many inanimate bits we collect on holidays etc. The author seems to have an inexhaustible imagination on how to produce personal memories using traditional techniques with a modern twist. She uses mixed media collage, surface stitching, layering and embellishing all with a vintage flavour. She is a fan of quiet or slow stitching, what some people refer to as mindfulness, a mouthful for the enjoyment we all know that comes from making something unique. The book is full of colourful illustrations to help a beginner or one less confidant. Before moving on to the section on equipment read the Inspiration chapter; it makes you itch to sort in the cupboard just storing pieces that “may “ come in useful. There is plenty of hand stitching designs plus machine ones. The author embraces hand block and ink jet printing plus using paper in a variety of ways. There are also handy hints on many pages. A very pleasant read and stimulating project book. 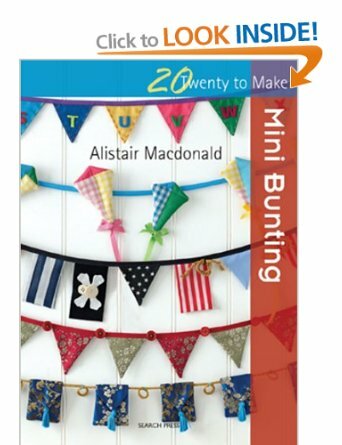 20 to knit is the sub title of this delightful small book; for those people who enjoy making quick projects it is ideal. Small amounts of wools and needles are all that is needed to make any item, whether for as gifts or decoration. Amounts required are given in metres or yards, very refreshing! Young people interested in this craft could also learn as making a character. Designs vary from Gingerbread House to a skiing Penguin, all worked in stocking stitch with a few added embroidery highlights. There are all the usual Christmas characters, a Nativity pair and items to hang on the tree. Clear making up instructions are included. The book is well produced with individual photographs of each project. This would certainly inspire a young knitter or more experienced one and add to seasonal decorations. The author admits she had a “fantastic time” organising the projects in this large paperback book; her enthusiasm show in the clever use of materials and designs. There are four levels of complexity so that a complete beginner can tackle with confidence the early patterns and gradually advance to more complicated designs. There is a detailed introduction to beads and other materials used in this craft, with beautiful colour photography to encourage a beginner. A page of tips warns of the usual pitfalls and how to rectify such. 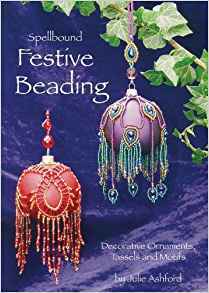 Projects fill most of the book, starting with basic stitch to delightful baubles and Christmas pudding earrings. 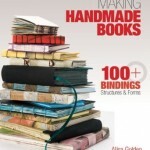 This book is colourful and well designed, with step by step drawn instructions from a very experienced author. This delightful book holds a variety of over 40 simple patterns of animals plus associated buildings and people. 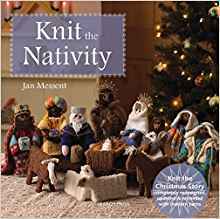 The author came to knitting and design after a career on Wall Street but has obviously found this more fulfilling than the making of money. She is involved with many crafts and thinks everyone should enjoy a creative activity. 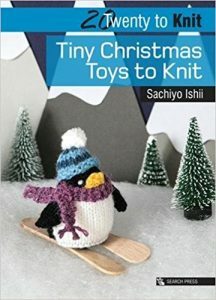 These knitting patterns require small amounts of wools; Sachiyo believes in using a variety of wools, whether intended for knitting or embroidery. Larger amounts are specified. The range of patterns reflects the number of animals found on a traditional English farm, which the author says contrasts with the restricted range on a Japanese farm. The Alpaca was very inviting but the range of animals is extensive. Fields with a pond make an attractive project for a new child or celebration; farm buildings can be added annually and the ground covered with some or all the animals. This may make a good group project. This book will no doubt appeal to people who enjoy having something on the go but being able to complete various aspects quickly. Enjoy! 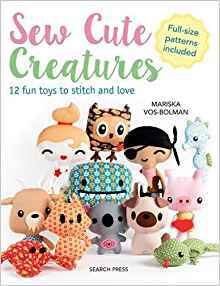 This book contains a delightful collection of soft toys created in adorable amigurumi style. The Dutch author has a very clear style, so that a pure beginner could achieve each character. She chooses interesting materials, with colours and patterns to appeal to various ages. The instructions are set out without clutter and the pure white paper helps to make each stage easy to follow. The first sections concern materials techniques and how to stuff the toys. The final section has full-size patterns for each toy. Between are chapters on each character again with detailed, clear instructions. They range from a pirate, mermaid, lizard and many other animals; something to appeal to every child. Whether you enjoy making soft toys or wish a young family member to learn the fun of making their own, this book will guide and inspire. The French author has produced an interesting collection of simple designs using this old craft. Techniques, practical knots, plaits and braids and flat knots are described clearly before the projects are shown. These range from simple bracelets to more complicated bags and necklaces. Clear photography certainly helps the newcomer. Some readers may remember this craft from the revival in the 70s but this slim volume brings it right up to date. A fun read and buy. Red work embroidery was popular 200 years ago when colour fast thread was introduced. Simple outline designs were given to young girls when learning. The simple style in one colour has regained popularity. 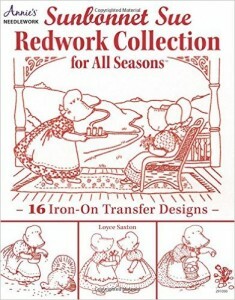 The 16 iron-on transfer designs in this large softcover are inspired by Bertha Corbett, and the American author uses her many years of sewing and design to produce a series of delightful pictures. The introduction gives clear instructions regarding material, threads and working order. The designs are very simple but with much charm. The book includes a transfer and tracing for each pattern. All the printing is crisp and the pages clear. This is a pleasant book to read, with 12 designs for all seasons of the year. 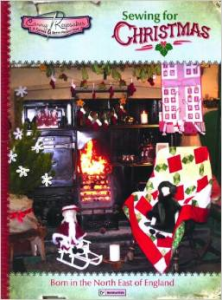 This large slim paperback contains 5 detailed Advance level Quilt patterns. Each has details of size, materials required and templates of blocks. There are very detailed instructions of how to construct each quilt, the order of work and how to complete each quilt. There are also pictures of the reverse showing the attractive patterns made by the machining. 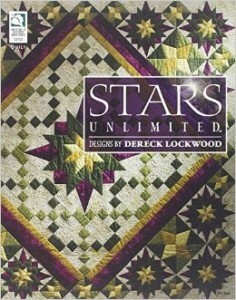 If you love star quilts, you won’t want to miss the unique designs in this book. In every quilt, the stars sparkle with a life of their own due to his colour selection and unique design. If you are looking for a challenge, you will find quilts that are for advanced quilters, definitely not for the timid. Making these quilts will be a labour of love because the end result, an absolutely gorgeous star quilt, will be an heirloom that will be passed from generation to generation. These quilts will show your quilting skill to all and speak of your love of quilting. Dereck’s designs have an architectural look, even though he uses many traditional blocks. His designs take the simple and stretch the imagination so at first glance you don’t even see the traditional. You will love this galaxy of five star quilts by Dereck Lockwood. 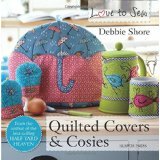 QUILTED COVERS AND COSIES by Debbie Shore in Love to Sew series. 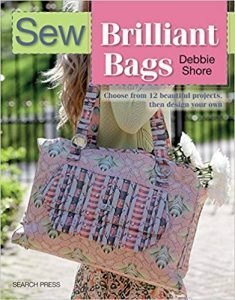 This is another delightful collection os projects from the author of “Half Yard Heaven” and “Half Yard Christmas”. These items can all be made by an absolute beginner as the requirements are simple and the instructions very clear. 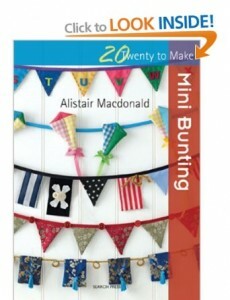 All ages will benefit from the author’s imaginative use of embroidery on quite mundane items to brighten any home. This book will make an excellent present for a young or new sewer.. I especially liked the Umbrella tea cosy and toaster cover designed like a caravan! You’ll never buy a button gain if you follow all the schemes in this very attractive book. The author is a German multi talented craft person who also teaches, writes and illustrates. Many of the photos remind me of sweets, especially the beaded designs. Crochet, embroidery and modelling clay are among the basic materials used; even furniture knobs are produced by this clever lady. One section is on transforming old buttons into new, so now I know what to do with the collection of old buttons that has been lurking at the back of my craft space. Making buttons from an old pair of jeans is beyond my imagination but this lady can do it! This book contains 25 different techniques and projects; each is carefully explained and illustrated. 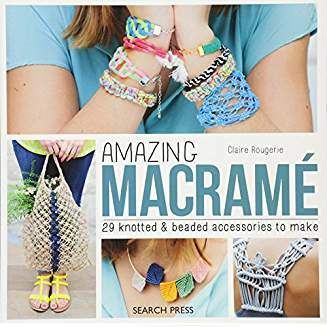 This book makes delicious reading whether you sew/bead/crochet etc. It will encourage young or mature, beginner or experienced. Have a go!! The author presents the simple equipment and techniques required to make your own netting. There are detailed illustrations for netting backgrounds in a variety of sizes and shapes, also numerous edgings. My first encounter with netting was to make a pram net after my daughter’s birth. 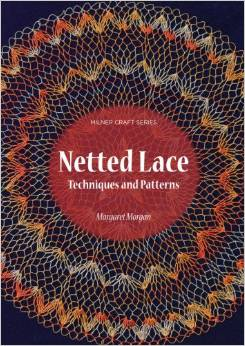 This book shows the many uses for the net as background to more complicated embroidery. The circular mats and edges remind me of the fine crocheting I learnt. There is an attractive chapter of shawls and scarves, all looking like cobwebs. The finished items certainly show what the dedicated crafts person can produce, with practise and the inspiration of the author. This slim volume would make a good souvenir of your visit to Beamish Museum. There are plenty of simple projects that would appeal to youngsters handy with a needle, a fun rag ball Robin and anecdotes interspersed with seasonal recipes. They have also included some of Florrie’s anecdotes, Betty’s rhymes and recipes and informative newspaper articles. Prepare for the countdown to Christmas with a fabulous Advent Calendar, make your own Festive Stationery and get ready to decorate your home with a Homespun Garland, Lap Quilt and Table Centrepiece. Get into the spirit of a vintage Christmas that means as much today as it did over 100 years ago. A good book for a young stitchers stocking! 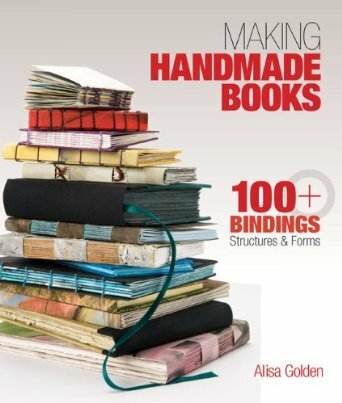 You can create unique books with just a few supplies, then add several other basic materials and the possibilities for creativity become virtually endless. Discover how to make your ideas a reality with step-by-step instructions and clear diagrams for crafting a variety of fabulous structures, from folded, glued, and sewn designs to scroll and accordion, moveable, and codex projects. Tell a family story, rubber stamp a poem, use photographs in sequence and your book comes alive as a very personal volume. There are also inventive envelopes and portfolios, as well as lovely boxes and slipcases. You’ll even learn what some of the artists have to say about their process or work. 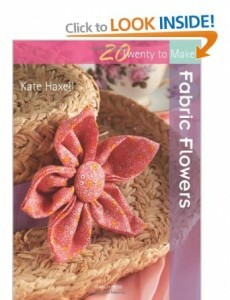 This book contains twenty fabulous flowers, all easy to make and designed to suit all sorts of tastes and styles. Choose from a pinked flower in fabulous fabrics to ornament a hair clip, a vibrant felt flower for your winter coat, a sparkling creation to pin to a clutch bag, plus many more. Attach them to shoe clips to make the most of ballet flats, to hats, to a bag to add instant detail, or to curtain tiebacks for interior style. You need no special skills to make the flowers and stitch instructions are included. Where it is appropriate templates are supplied, and many of the flowers need only scraps of fabric and can be made in an afternoon. We should remember these 2 volumes when deciding how to celebrate our big anniversary in 2016! 20 fresh, quirky, modern designs for decorating your home or party venue are shown, including new twists for Christmas, using international influences ie Irish bunting and Japanese silk bunting. The techniques are explained at the start then it is straight into the designs. Cute, adorable, soft and cuddly- daisy dolls are fun to make and embellish with pretty hairstyles, clothes and accessories. Create your dolls following the beautifully photographed, step-by-step instructions, then make them delightful little outfits using the templates provided at the back of the book. 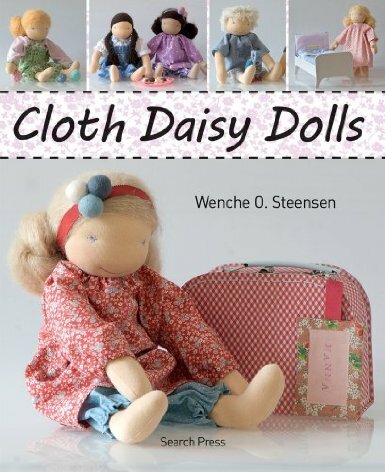 With inspiring images of the finished dolls and their clothes, daisy dolls are the perfect project for crafters of all levels. Using clear, step-by-step instructions and gorgeous photographs, Jan Horrox shows you how to make exquisitely crafted fantasy dolls, including magical fairies, mermaids, a witch, and a steampunk doll. Detailed instructions are provided on how to sculpt and colour the face; form hands, feet, wings and mermaids’ tails; and create fabulous costumes using a variety of fabrics, paints and embellishments. Full-size templates for all the body parts are provided at the back of the book. Karen Walkers bright, appealing buttons make a fun, stylish addition to your accessories. Ranging from classic round buttons to quirky ladybirds, toadstools and Russian dolls, you are sure to find something to bring a little fun to your hat, scarf, or handbag. Try them out as charms or attach them to greetings cards or scrapbook pages. There are twenty designs plus variations which are easy, inexpensive and fun to make and clear instructions are included. A delightful collection of country themed gifts which would be welcomed by anyone. Cuddly rabbits with elegant outfits, perky chickens, snooty cats and lovable odd characters with carrot noses are some of the delightful creations to be found in this new book. 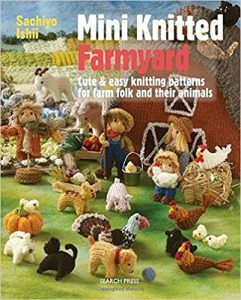 There are lots of ideas and easy to follow instructions for creating your own farmyard full of quirky and lovable creatures. 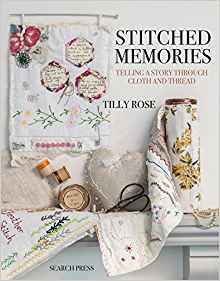 The author uses rustic themed fabrics in a tweedy and muted colour range in keeping with the theme to give an authentic touch to her creations. 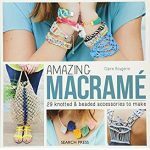 This is an ideal book for anyone who enjoys making gifts for friends and family, they would bring a smile to anyone face. Hanging hearts are popular trendy items which are enjoyed at weddings, Christenings and Valentines day. They make excellent gifts and can also be displayed around the home. 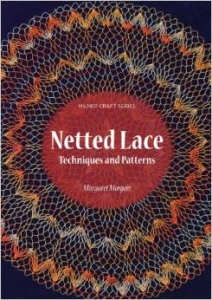 In this book,the author explains both hand and machine methods of stitching and basic techniques. There are twenty projects reflecting vintage, French country style and shabby chic, which would be great fun to make and even better to receive. These hearts are quick and easy to make and full size templates are included. 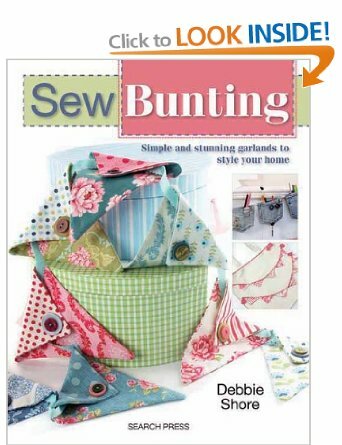 Suitable for beginners and more experienced stitchers. This book aims to provide lots of templates for card-makers and is divided into eight chapters, each with four designs, graded according to the level of difficulty. There are coloured illustrations for each design, showing how the designs can be developed depending on the skills of the stitcher. The actual instructions are shown clearly with lots of helpful hints for working the designs. A list of materials and recommended threads is included. The authors state that their aim is ‘to create designs for cards which are as pretty as possible’ and they do illustrate designs which have the personal touch. 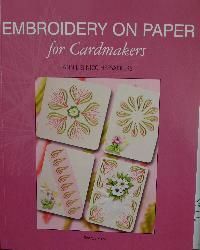 This book would be ideal for both beginners and more accomplished card-makers and should provide lots of enjoyment.